This handy 3 LED light comes in it's own metal tin presentation box. With stylish rubber accents and a wristlet or lanyard handle it is sure to be a hit. 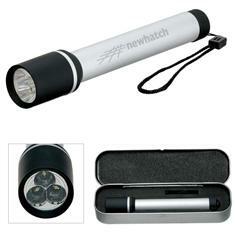 Light up your next gifting event with our 3 LED flashlight! Imprint Area: 2-1/2" x 3/8"